This is a priceless piece of advice that still holds water and heavily resonates today. Spoken by famed American philosopher and essayist, Henry David Thoreau, this slogan or tagline has truly been the secret formula behind many of America’s greatest fortunes. While we all dream of winning the next Mega Millions or Powerball, the odds are nearly impossible – and our losing tickets quickly bring us back to reality. While many wealthy people have amassed their fortunes via personal inheritances – others have worked hard to get what they have. However, the secret to becoming rich is living a simple and somewhat frugal lifestyle. For example: in order to lose weight and get back into shape, you need to burn more calories and fat than you consume. Similarly, you must save money and invest it wisely to secure financial stability and security. 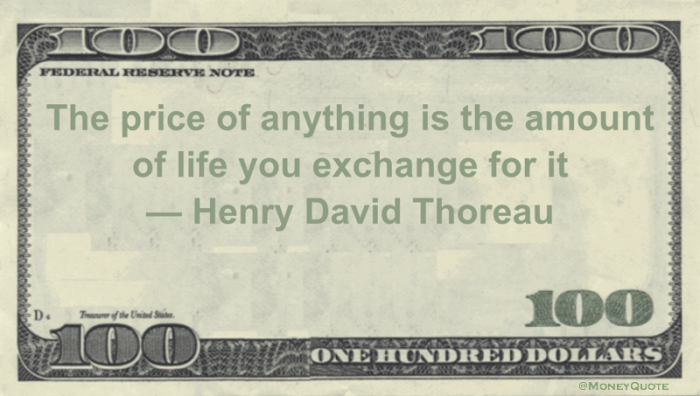 According to Thoreau – who was an avid tax resister – keeping your wants and needs to a minimum can truly benefit the wallet, savings account, and piggy banks. Instead of dining at exquisite, lavish, and fine restaurants – can you not satisfy your hunger with a healthier and cost-effective meal? Instead of spending countless dollars on DVDs, video games, and online movie rentals or digital subscriptions, what is wrong with reading a book or watching basic cable? These are surely sacrifices that need to be made if you truly want to keep more of your earnings. Yes, the basic essentials are still..um..essential. This includes food and groceries, along with electricity, utilities, and other mandatory spending. However, Thoreau made it to the top at a time where these common amenities and luxuries were not part of society. He simply curtailed his desires, invested wisely, and saved the money he earned from all his endeavors. In these turbulent and incredibility materialistic times, there are many that choose to live simple and basic lifestyles. While they are surely allowed to partake in fun and festive activities every now and then – their goals are to save and build lasting futures for themselves and their loved ones. It might be time to get back to the basics folks – especially if you want to someday have the financial security you dream of. What are some ways you try and save money?